Temperatures rise, the sun shines in its peak and the plain turns into golden. 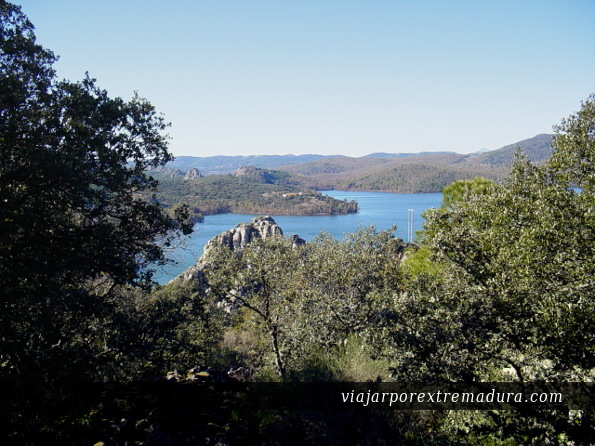 It is time to travel, know and enjoy Extremadura and its amazing natural surroundings. A perfect time to be delighted with the fresh water of gorges, rivers, natural swimming pools, dams,lakes… Silent and calmness afternoons lead to noisy nights where there are lot of things to see and do. Summertime is the perfect season to know new places and choose among a wide variety of cultural activities. Nevertheless, Extremadura’s natural enviroment is an unquestionable representative of the region. From South up to North thousands of little wonderful paradises are waiting for us to become our secret garden. At the North green colour embellishes the landscape meanwhile streams, gorges and waterfalls invite the traveller to take his time and enjoy such place by means of having a bath in the natural swimming pools and gorges. 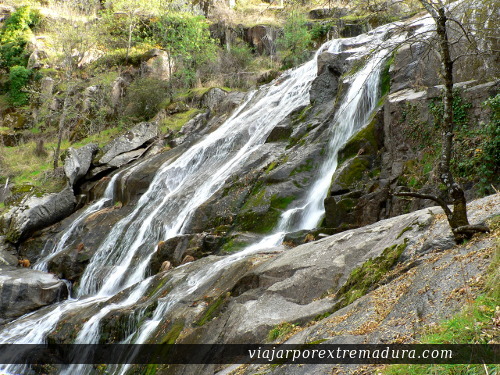 In the region of La Vera there are thousands of atractive activities and places, specially Devil’s Waterfall, Cuartos Gorge or the stream in Garganta la Olla. 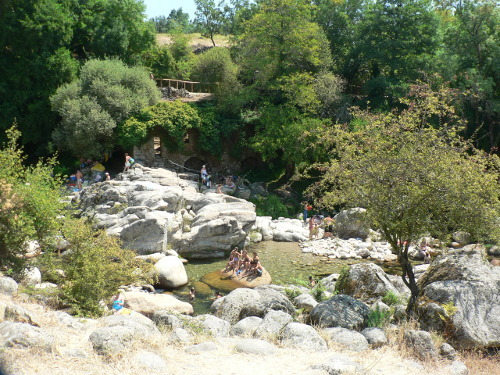 Close to La Vera, in Jerte Valley stands out Infernos Natural Gorge, this is one of the most famous places in the region and Extremadura as well as the Caozo waterfall (Cascada del Caozo); it is a paradisiac realmn almost charmed. Sierra de Gata is another northern area bathed with the pleasant rumour of water. 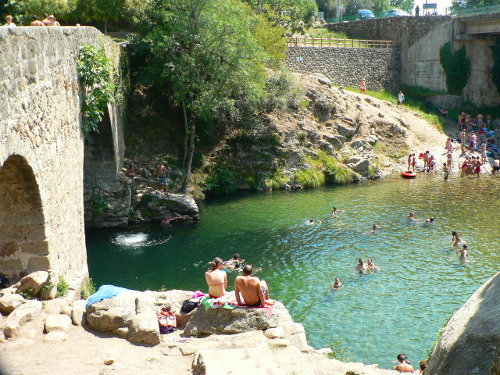 Due to its mountainous situation water descends from the top of the mountains giving rise to gorges, streams and natural swimming pools like Descargamaría swimming pool, Acebo’s and many more where you may have a great day. We have to bear in mind that close to Moraleja Borbollón Damn is the perfect place to practice nautical sports. As we head South we come across big damns, lakes and rivers. In the regions of La Serena y La Siberia there is a net of five damns: la Serena, Zújar, García Sola, Orellana and Cíjara’s Natural Park . All of them are suitable to practice nautical sports such as sailing. The water acquires a new magnitude when is used in spas . The most antique are placed in Alange and Baños de Montemayor, both were built in the Roman age, however, they are not the only ones, El Raposo, Fuentes del Trampal, San Gregorio o Valdefernando. All of them offer advance treatments to relax us and make us feel good. From Hydrothermal treatments to walks in their gardens will benefit us phisically and mentally. Summertime is the best season to enjoy water, but also have a great time in feasts and celebrations of interest, or to taste the refreshing dishes cooked only during this season. Nevertheless, at night on of the most pleasant momments takes place, that is: to meet and gather with the visitors and the inhabitants of the municipalities and towns. In all the regions there are outstanding feasts and celebrations based on typical customs and municipalities’ History which have lasted until present day like La Enramá in Pinofranqueado, or Las Diablas in Valverderde de Leganés, or Martes Mayor (big tuesday) in Plasencia. Among a great amount of cultural activities stands out Merida Classical Theatre Festival, Cáceres Classical Theatre Festival, or Alcantara Classical Theatre Festival [by means of Classical there are two periods, Greek and Roman Ages, and later on Golden Age or Classical Spanish Theatre, 15th-16th and 17 th Centuries]. However, there are many more festivals such as Theatre of Extremadura Festival in Ribera del Fresno, Villanueva de la Serena Theatre on the Street Festival and FICA- Audiovisual Creation International Festival also in this town. Drama in Extremadura is a long-standing tradition and as a proof of this we may find the open air performance of The Mayor of Zalamea written by Calderón de la Barca and set in Zalamea de la Serena. 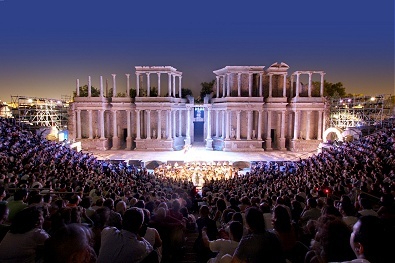 Theatre in the Night Youth Festival in the Roman Theatre of Regina in Casas de Reina. Middle Ages Town of Alburquerque Festival. Templar Festival in Jerez de los Caballeros where the Legend of Templar Knights is performed. Or International Festival of La Sierra in Fregenal de la Sierra..